The Herb Lubalin Study Center at The Cooper Union examines the influence and impact of graphic design on the pharmaceutical industry in PHARMA, a new exhibit featuring original and rarely seen works by luminaries including Andy Warhol, Lester Beall, Will Burtin and Herb Lubalin. PHARMA's exploration begins with the avant garde promotionals of the 1940's, when a market need emerged to promote "miracle" drugs, such as Penicillin, to the medical industry. 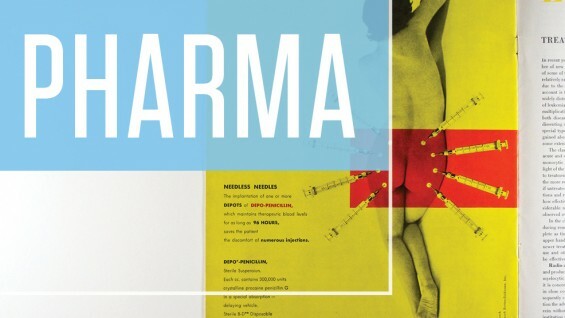 In a compelling and thought provoking way, PHARMA presents the relationship graphic design has had with the pharmaceutical industry ranging from the federal government's increased regulations to new marketing tactics where the everyday consumer, not the doctor, is considered the target audience. While the exhibition provides examples of past and present, the public is encouraged to reflect and question how graphic design is used to market drugs and design has transformed these commodities into objects of desire. how the ubiquity of pharmaceutical marketing cultivates the creation of spoofs, serves as source material for artists, and created a new niche of products such as "cosmeceuticals."